At first blanch the all vegetables and keep aside. White sauce: Heat butter in a pan and add chopped garlic. When it turns golden add flour and milk and keep stirring well so that no lump is formed. When it becomes thick, add pepper powder and mustard powder and mix +well. White sauce is now ready. Now take a bowl and grate the boiled potato and smash it. Now add tomato ketchup, cream and half of the cheese and mix it very gently. Now take the white sauce and add the blanched vegetables and mix it gently. Then grease a baking dish and put the vegetables mixture. 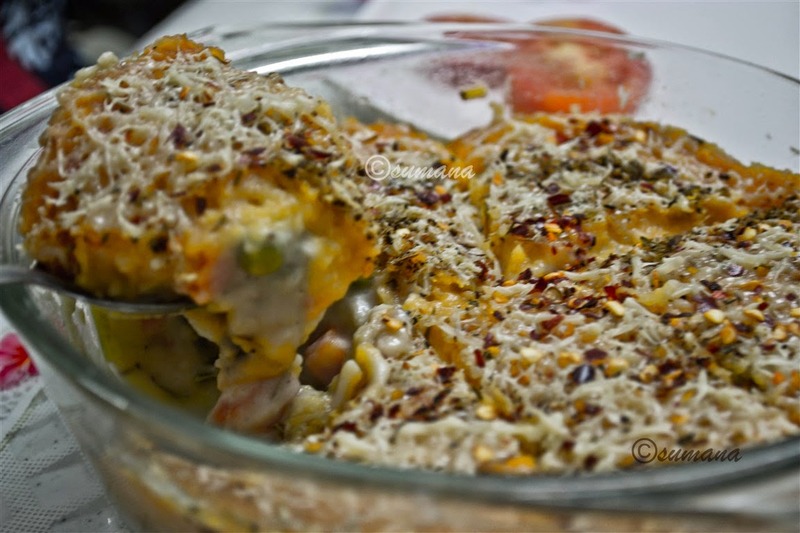 Make a layer of smashed potato above the vegetable mix. Spread the remaining cheese and sprinkle some herbs on top. Now bake it at 180c for 20 minutes.